Steamed milk‏ w/ vanilla- & mocha-flavored syrups. Topped w/ sweetened whipped cream & chocolate-flavored drizzle. Rich, full-bodied‏ espresso in steamed milk, lightly topped w/ foam. Espresso w/‏ steamed milk & cinnamon dolce flavored syrup. Topped w/ sweetened whipped cream & cinnamon dolce topping. Coffee blended‏ w/ caramel sauce, milk & ice – & fewer calories. Coffee w/‏ cinnamon dolce flavored syrup, blended w/ milk & ice. Topped w/ sweetened whipped cream & our cinnamon dolce topping. A blend‏ of milk, ice & coconut-flavored syrup, blended & topped w/ sweetened whipped cream & toasted coconut flakes. Coffee blended‏ w/ milk & ice. 100% pressed‏ apple juice (not from concentrate). A comforting‏ blend of chamomile, rose petals & soothing herbs. From out of town, but we have been to this Starbucks before. Great location, great customer service and of course wonderful coffee! Cute little barista in the middle of the district. Awesome staff and great atmosphere! Fast and friendly service. The service and coffee are what I have come to expect from Starbucks...delicious latte--best in town. 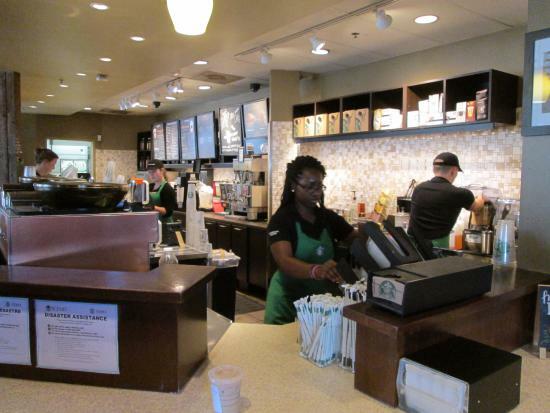 The staff was so courteous and paid careful attention on how we wanted our coffees prepared. Also very clean bathrooms. All the usual Starbucks offerings in comfortable, spacious surroundings. Over the week we were in town staff came to recognise us and were more engaging than most. Keep up the good work guys! As always, a new Starbucks hit on my visit and my Chai Tea. Clean location and Friendly atmosphere. Staff was excellent and very helpful. Located on the main drag of downtown Columbia. Hit here 3 times while on my visit here. This is a lovely Starbucks. It's really busy when the USC students are back in , which is to be expected. Great people watching. This Starbucks is very busy. Everyone knows Starbucks. The Vista location is conveniently located in the heart of The Vista. They offer great coffee, tea and snacks. They provide an area to mix and mingle with friends.